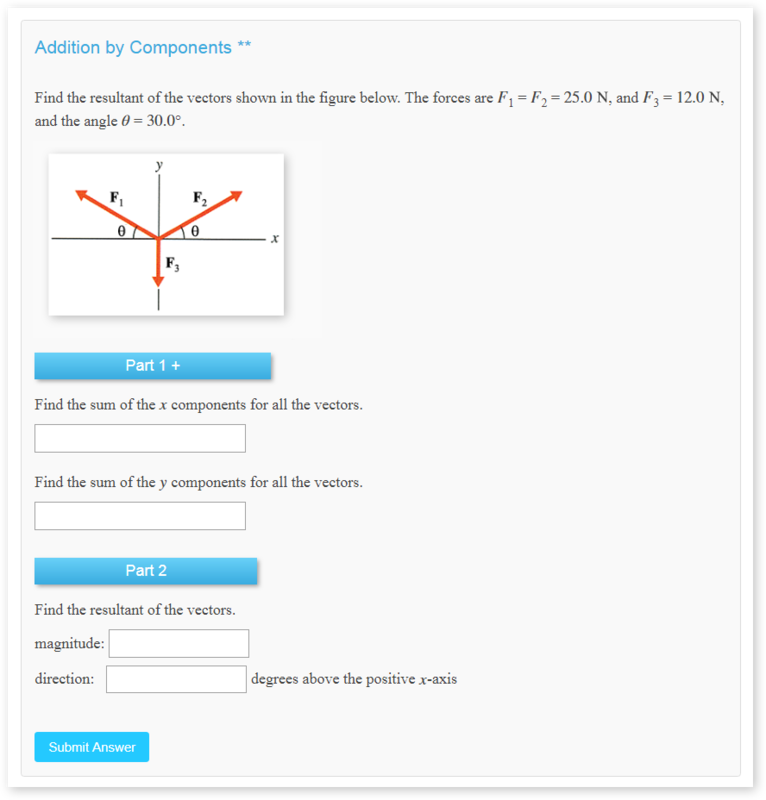 Physics LE is an online learning environment for algebra-based physics courses providing online homework and quizzes. Features include: randomized values, intermediate problem-solving steps, and an advanced grading system. Physics LE Question Bank is universal and comprised of a comprehensive library of over 3500 problems. The stand-alone problems can be aligned with any algebra-based introductory physics course. Students receive specific feedback when solving problems, with their answers evaluated using sophisticated algorithms. The system emulates the rigorous process of an instructor performing manual grading. Problems employ intermediate steps to help students formulate a problem-solving strategy, and randomized values to give each student a unique version of the problem. Physics Fundamentals eTextbook by Vincent Coletta is built into Physics LE and accessible to every student. The eTextbook is comprised of 30 Chapters, 960 pages, and 1500 photographs & illustrations. Physics LE built on the Moodle platform offering numerous in-depth features along with a reliable and secure online environment. The Physics LE Question Bank is comprised of a comprehensive library of over 3500 problems for algebra-based introductory physics, covering a full-year course. The Physics LE Question Bank is universal—the extensive collection of problems offer wide versatility, along with varying levels of difficulty, to align with any college or high school algebra-based physics course. Individual problems are categorized by general topic headings to provide quick and easy correlation to your course (e.g., acceleration in one-dimension, projectile motion, work and kinetic energy, electric fields, . . . ). 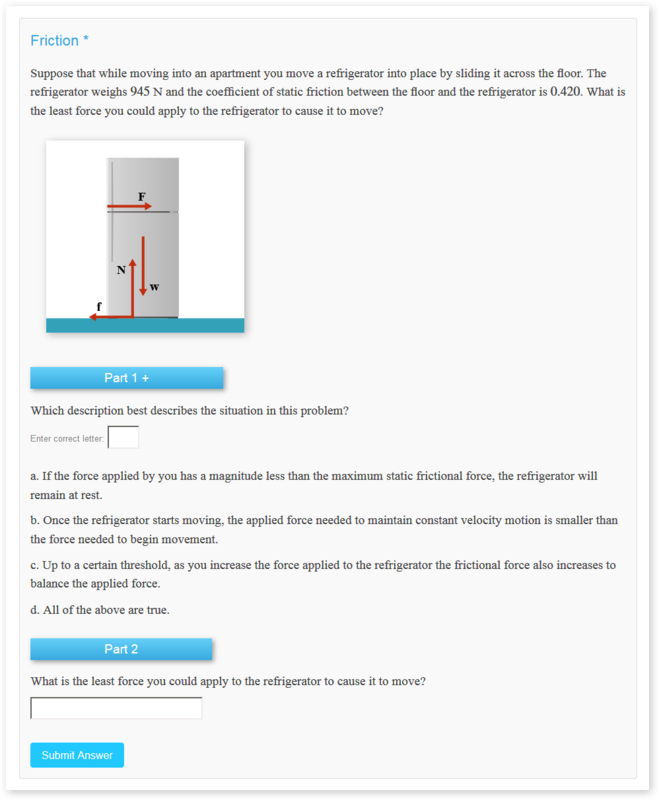 For users of Physics Fundamentals by Vincent Coletta, all chapter-end problems in the textbook are included in the Physics LE Question Bank. Rather than just requiring students to enter a final numerical value, many Physics LE problems incorporate intermediate problem-solving steps to help guide the student through the problem, also allowing partial credit to be awarded. Intermediate steps include assorted use of: 1) multiple-choice questions checking for understanding and problem-solving approach (using text or diagrams), 2) input of relevant equations or algebraic expressions, and 3) input of intermediate numerical values which need to be calculated to obtain the final answer. For all numerical answers, specific feedback is provided to students using sophisticated algorithms which evaluate the following: the correct numerical value (within a set tolerance), the correct number of significant figures, the correct unit, order of magnitude errors, and common misconception errors. All numerical problems require students to input their answer using the correct number of significant figures and the correct unit. Students are guided to make any necessary corrections regarding significant figures prior to the grading system evaluating their answer. Based upon the desired objective for the assignment or quiz, the instructor can choose how students interact with problems: single attempt only, multiple attempts with no penalties, or multiple attempts with penalties. The Physics LE Question Bank is continually growing with new problems being added on a daily basis. Instructors are encouraged to submit problems they would like to have added to the question bank—simply submit problems in written form and the Physics LE team will do the coding. The Statistics & Student Results modules allow the instructor to quickly assess student performance on an assignment or quiz. This can can help identify patterns and how well students are grasping the material. Overall assignment or quiz - average score, median score, standard deviation, skewness, error ratio, and standard error. Individual problems - average score, standard deviation, intended weight, effective weight, and discrimination index. Individual students - overall score and score for each question, as well as responses to individual questions. 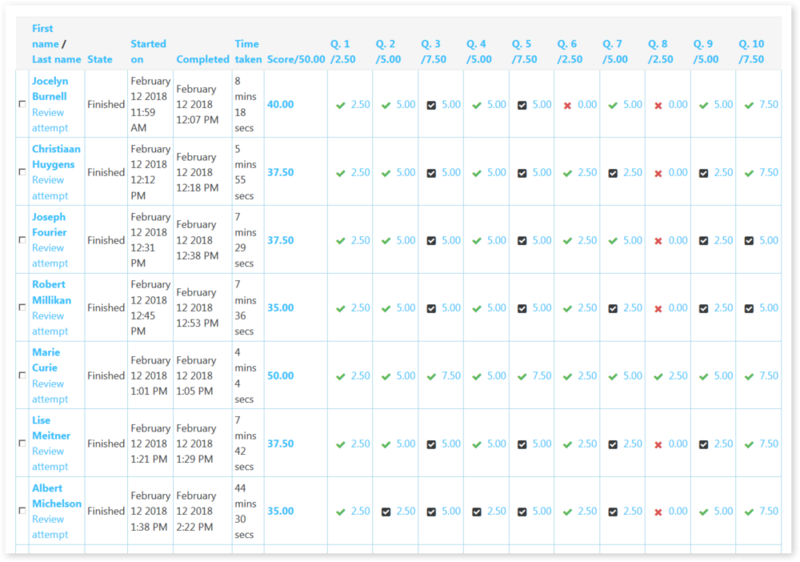 The Physics LE Gradebook automatically records student scores in the proper category (e.g., homework, quizzes, or a custom category). The desired weighting can be assigned to individual assignments & quizzes, with overall weighting assigned to categories. Grading curves can easily be established to automatically determine a letter grade. The Gradebook can be readily exported in a variety of formats. The Physics Fundamentals eTextbook by Vincent Coletta is built into Physics LE and accessible to every student at no extra cost. The eTextbook is comprised of 30 Chapters, 960 pages, and 1500 photographs and illustrations. The Physics LE Question Bank directly syncs with all problems contained in the Physics Fundamentals textbook. Dr. Coletta is a Professor of Physics at Loyola Marymount University in Los Angeles. His research in PER (Physics Education Research) has provided better understanding into student reasoning skills and strategies to address difficulties students encounter in learning physics. More information about Dr. Coletta's Physics Fundamentals textbook.